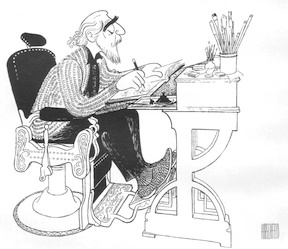 "For more than eight decades, Al Hirschfeld created virtually all of his legendary drawings at this chair and table. Whether it was the latest Broadway opening, the release of next Academy Award-winning film, a new ballet, a classic opera, or portraits of the players in all of these and more, no one documented more of the lively arts of the 20th and 21st century than he did. While he made his lines in ink fly, leap and dash, he sat in a barber chair, which he called the “last functional chair” because it could go up, down, swivel and recline. Look for this table to present rotating examples of Hirschfeld’s art each time you come to the Library."